Hi, me again been very busy over the summer doing very little in the way of illustrations but have now got back to work again and at present illustrating a book about cooking with Cannabis. 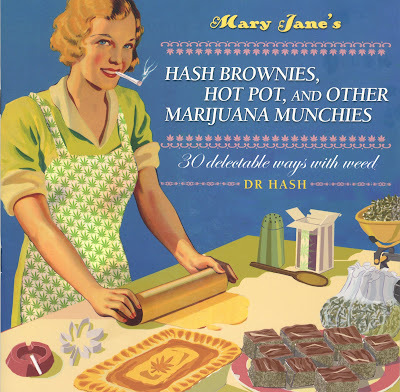 Called "Hash Brownies,Hot Pots and other Marijuana munches" it is a sideways look at using this herb in cooking. The text is very funny and relates tails from the life of Dr Hash and presents 30 delectable recipes with weed accompanied by amusing and sometimes mind-blowing stories. The design of the book has a very 1950's illustrative feel with the cover drawn by your truly in a 1950's house wives way. The images inside also follow this direction and as it is not wise to fill up your photo studio with marijuana the book is fully illustrated. Here's the cover for you to see while the book is due for publication early next year. Details to follow.